Allocating a budget for paying several bills and fees in a single month is not an easy responsibility especially if the earnings of an individual barely meets his needs. This is the reason why there are institutions and organizations who offer opportunities for low to average earners for them to have a sponsor or be shouldered from their financial obligations. One of the most common types of sponsorship is known as house rent allowance benefits wherein an allowance form must be used by the applicants and the approved beneficiaries receiving the allowance amounts during payment schedules and days. What Are House Rent Allowance Forms? House rent allowance forms are documents which are provided for beneficiaries of house rent allowances. These forms are created to cater the information of the beneficiary especially during the application period in determining the applicant’s eligibility to obtain the allowance and in calculating how much the eligible applicants’ allowance amounts will be. 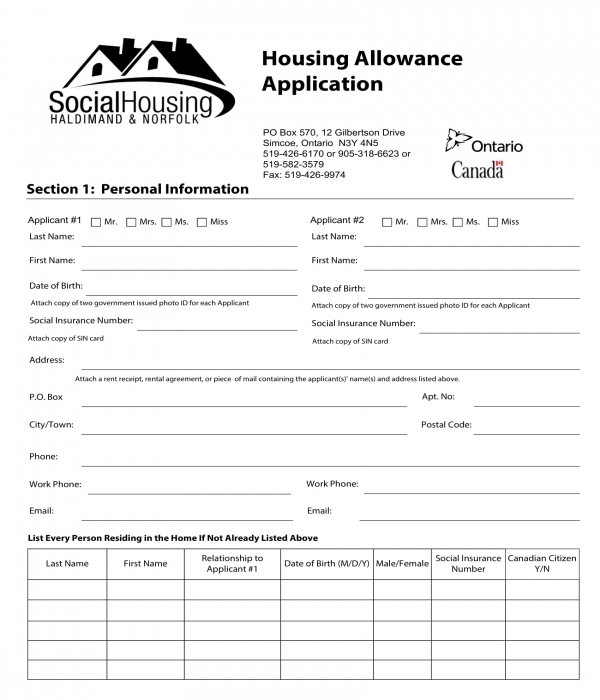 House Rent Allowance Application Form – During the application process, a house rent allowance application form is presented to the applicants for them to disclose their personal information to begin applying for the allowance benefits. The personal information of the applicant along with the income statement are some of the details to be stated in the application form. 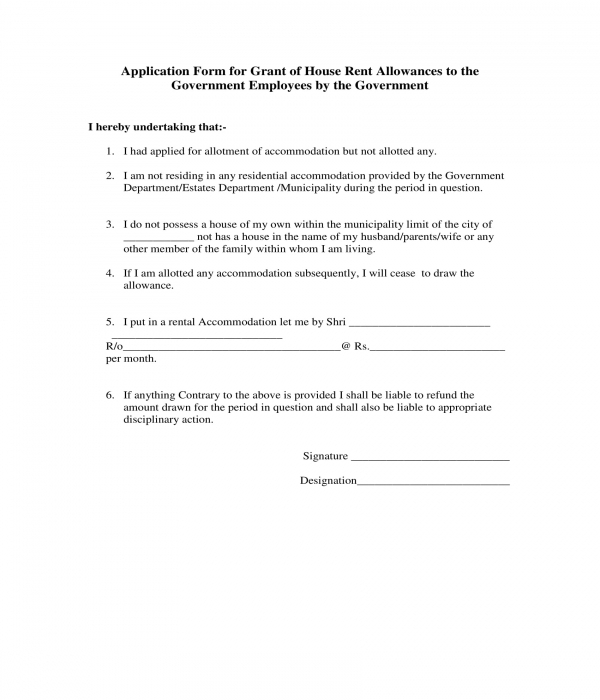 House Rent Allowance Application Statement Form – This variety of house rent allowance form is an accompaniment document for allowance applicants. The form consists of basic sections which identify the name of the landlord whom the applicant is renting a location where he currently resides in and the amount of rent that the applicant is paying on a monthly basis to the landlord. In addition, the signature of the applicant along with the date of when he is filling out the application statement form is required to be included as well. 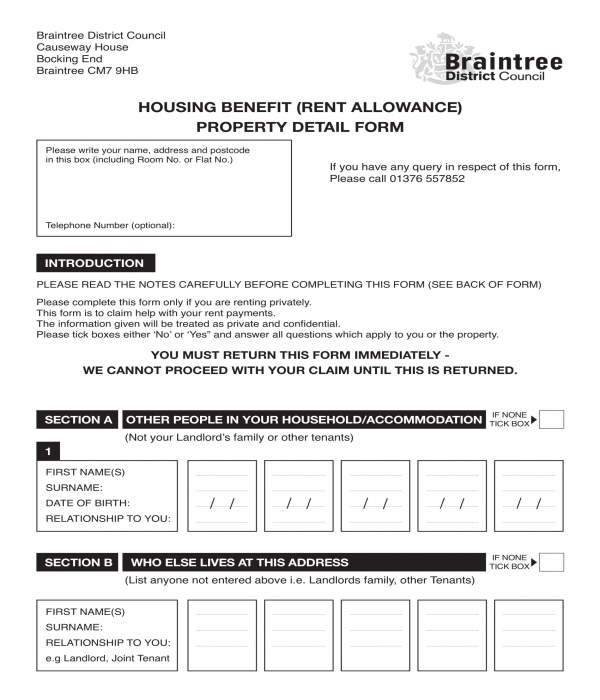 House Rent Allowance Claim Certificate Form – To prove to the house rent allowance providers that an individual is indeed a recipient or a beneficiary of the allowance benefits, a house rent allowance claim certificate form needs to be completed and submitted. 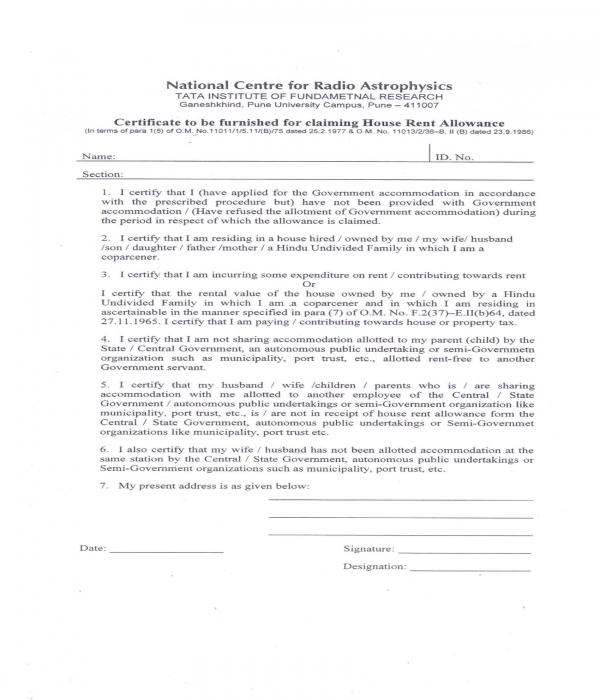 This certificate form will consist of a list of statements which centers on the claims of the beneficiary along with the disclosure of his address and the date of when he submitted the certificate to the allowance providers. House Rent Allowance Property Details Form – This document is another type of form which should be provided by the beneficiary or the applicant to prove the accuracy and details of his allowance claims. The house rent allowance property details form contains nine sections wherein the last section is only intended to be used by the renter’s landlord. The sections in the form are labeled with letters. The form’s sections A and B will identify the names of the people who are accommodating the property with the renter or the beneficiary. Section C focuses on gathering the tenancy information of the beneficiary such as the date of when he began his rental or have signed a lease agreement, the name and address of his landlord, and whether his landlord is a close family relative or not. The description of the renter’s accommodation, the location of the room that he is renting, and the type of furnishing that the landlord provided for the renter are all defined in section D of the form. The rental charges and payments which are the financial responsibilities of the renter or the beneficiary are stated in the form’s section E while the section F of the form contains a declaration statement to be signed by the beneficiary declaring that the information he disclosed is factual and accurate. The beneficiary’s chosen payment method is catered in the form’s section G which indicates his account information. If the beneficiary prefers to receive his payment from his landlord, then he must fill out the section H of the form with his name and signature. Lastly, the section I of the is form is where the landlord will indicate that he accepts his responsibility in the allowance of the beneficiary. Step 1: Create a personal information section. The personal information section should not only cater to the applicant’s name and address but also his social security number, date of birth, and his marital status. Other pieces of information which can be collected in this section include the applicant’s work and home contact information, as well as the applicant’s list of family members who are residing with him in his rented property. Step 2: Incorporate a table for the gross household income information. The gross household income of the applicant’s household which includes the income of every member living in his residences who are employed is essential to be stated and defined in the form. The importance of having the income information of the applicant’s household is to aid the organization in adequately allocating the ample amount of allowance to be given to the applicant. The table for the gross income information of the applicant should collect the details of the applicant’s income sources and the description of the applicant’s rental unit. Step 3: Add a section for the applicant’s expenses. This section is intended to gather the payment amounts that the applicant is required to pay ranging from the monthly rental fees up to the utility bills of the applicant for the electric and water usage in a month. The landlord’s general information should also be stated in this section of the form below the bills and payment details. Step 4: Include a declaration and release statement. The purpose of incorporating a declaration and release statement is to document that the applicant has sworn to supply only accurate information in the form and have confirmed in allowing the authorities of the organization to execute a verification procedure to validate his claimed information. Step 5: End the form with a signature block. The signature block should have lines where the applicant will be able to affix his signature and the date of when he used the form. 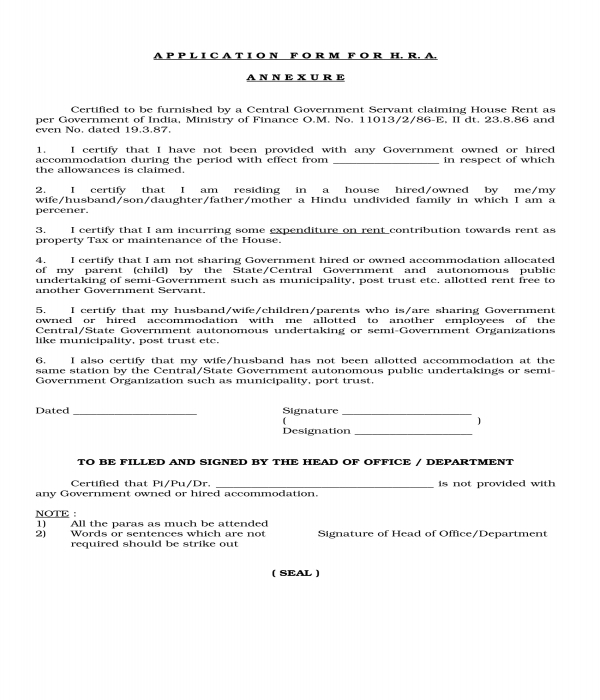 Other than the applicant, the individuals who are also residing with the applicant are also often required to sign the form as well as the landlord. The signatures of the other residents and landlord serve as a proof of witnessing the claims of the applicant. Lease agreement – The lease agreement form which will be enclosed with the application should be the one which had been signed by both the applicant and his landlord. The agreement will serve as a proof the applicant’s tenancy which contains the details of the property that he is residing in, the rules and regulations mandated by the landlord, and the agreed fees to be paid by the applicant for him to be able to stay as a tenant in the landlord’s property. In addition, the agreement will also be a tool for determining if the tenancy of the applicant is legal or that the landlord has met the regulations of the State with regards to opening leases for his properties. Rent receipt forms – The rent receipt forms, along with the bills payment receipts, of the applicant will prove that he had been staying in the property and have been responsible for paying his utility bills in a span of time. The receipts will allow the organization in knowing how much the applicant is paying and in determining how much they should allocate for the applicant’s allowance if the application will be approved. Proof of income – Just like the applicant’s receipt forms which serve as his proof of paying his rental fees, his income statements and even a duplicate of his current payslip are necessary to be enclosed with the applications. The applicant’s proof of income documents will be used for determining the applicant’s level of eligibility such as whether the applicant falls into the category of people in need of the allowance or not. Regardless of the variety of house rent allowance application form that an applicant will be using and will be completing, it is important that the organization who will be gathering the form with the applicant’s data and information will treat the document as a private and confidential paperwork. The disclosed information in the form must only be used for purposes related to the intent of the applicant.